Western Plains Zoo with the simple goal of raising enough money to secure Dubbo a spot on the Charity Edition of Monopoly. Arriving in Dubbo after 420km over three days of cycling, with Dubbo securely on the Monopoly board, the Zoo2Zoo was born. Not wanting to let a good thing go, the challenge has grown each year with the riders in 2007 raising over $37,000 to purchase vital medical equipment for the Dubbo Base Hospital. 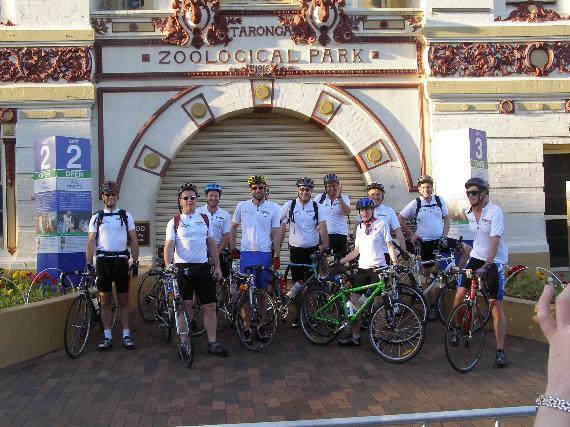 In 2008 the Zoo2Zoo went on to raise over $50,000 for the endangered Tasmanian Devils held at Western Plains Zoo. Since 2009 the Zoo2Zoo has raised in excess of $1,250,000 for the Black Dog Institute, a not-for-profit, educational, research, clinical and community-oriented facility offering specialist expertise in depression and bipolar disorder. Molong to Dubbo Multiple Stage Ride in October. If you love the idea of riding your bike through some of the countries best scenery, whilst raising awareness and donations for an Institute whose mission is to advance the understanding, diagnosis and management of mood disorders by continuously raising clinical, research, education and training standards, whilst aiming to improve the lives of those affected - and in turn - the lives of their families and friends, then we would love you to come along for a ride.